Oil Water Interface meters are suitable for the measurement of floating product – LNAPL (Light non aqueous phase liquids) and sinking product – DNAPL (Dense non aqueous phase liquids) in a both surface water and ground water applications. The meter itself works by utilising light rays and electrical conductivity. When the probe on the meter reaches the liquid surface of the well or borehole the infrared ray on the meter deflects and meter gives a sound and a light signal. If the medium that the meter contacts with is non-conductive such as an oil, the contact sensors on the meter are not triggered and the signal of the interface meter remains continuous. However if the probe contacts with water however, the contacts on the meter will experience a short, this in turn shuts of the infrared sensor and the output signal on the interface meter will then turn to pulsed signal. The user can then measure, using the tape, the corresponding water and interface levels of the well. 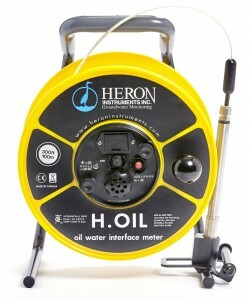 Why use Heron Instruments Oil Water Interface Meters?